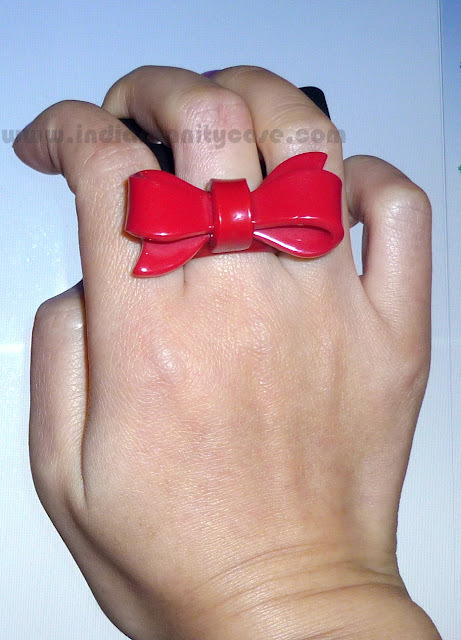 I have been yearning for a bow ring (a plastic one, not one of those Forever 21 bow rings with glued on bling), so when I stumbled upon this Cutesy Plastic Bow Ring in Accessorize today, I almost squealed with joy (or hugged the salesgirl if I were drunk). And it's red! I think it's perfect for Christmas, don't you think? Forgive the blah photo against my computer screen. I clicked in a jiffy & do you see how hard I tried to hide my fuchsia pink nails? =D. I will wear it with red nails and click a better picture. Available in Small, Medium & Large. I got in Small and it's still a little loose on me. Like an idiot I kept telling the SA to check if there's an XS lol. But I'll make it fit somehow. I am gonna get it tomorrow itself...thnx!!!! wow! love this. 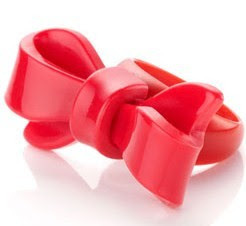 ♥ anything with bows and ribbons! come drop by sometime. its sooo cute!!!! i got a hairband with a cute bow just like this n i got it supercheap..65 bucks only!!!! It's cute and read color is so christmas like. Perfect. This ring is absolutely adorable!! I have it too! When I saw it for the first time I fell in ove with it! Follow me on my blog Fashion Addict!